In September 2017, construction began on Mystic Cruises’ expedition ship, World Explorer. It is being built at Portugal’s WestSea Yard. It will be the first in a series of expedition ships being built by Mystic Cruises and Mystic Invest. Mystic Invest is a Portuguese holding company with 14 different brands that operate in the tourism sector. Brands include Nicko Cruises, Duoro Azul, and Mystic Cruises. The president of Mystic Invest is Mario Ferreira. The history of the holding company dates back to 1993 when Portuguese entrepreneur, Mario Ferreira, formed Ferreira & Rayford Turismo with the boat, Vista Douro. In 1996 the DouroAzul brand was acquired with the vessels, Princesa do Douro and AltoDouro. Duoro Azul currently operates a fleet of 16 vessels. In 2015, Mystic Invest acquired Nicko Cruises (Nicko had previously filed for bankruptcy in 2013). Currently, Nicko Cruises has 20 river ships around the world. Although the Mystic Cruises brand is currently dedicated to the operation on the Amazon river, World Explorer is a 200-passenger ship being built as an ocean-going expedition ship under this brand. 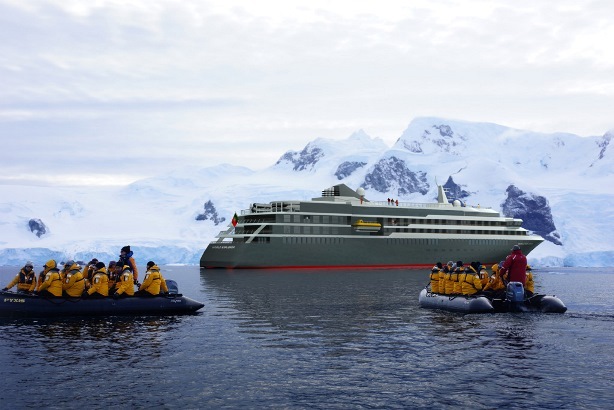 World Explorer is scheduled to debut in late 2018 and will be chartered out to Quark Expeditions for their 2018/2019 Antarctica season. In July 2017, Ferreira told Seatrade Cruise News, “Our aim is one per year for the next four years. We could go to 10.” When Mystic Cruises’ future expedition ships are not on charter, they’ll cruise for the Nicko Cruises brand.